Spring in Phoenix is an exciting time! There are so many places to go, people to visit, and events to attend. You may be able to function successfully this way for a week or two, but then you realize you are exhausted from constantly being on the run. The more tired you become, the harder it is to keep going. Not to mention how frustrating it is to have a packed calendar and not enough energy to manage your life. Obviously, the first step towards fixing low energy is making sure you are getting enough rest, eating well for your body, staying hydrated (especially important here in Phoenix), and reducing stress where possible. However, sometimes our bodies need a little extra help. At the Bienetre Center in Phoenix, we want you to make the most of your busy schedule and we can support you while you do it! Intravenous nutrients, B-12 shots, and herbal supplements quickly give your body the nutrition it needs while respecting your busy schedule. What are the benefits of IV Nutrients? IV nutrients are nutrients administered via an IV in our office. It is the fastest, simplest, quickest way to replenish your body’s health and vitality. 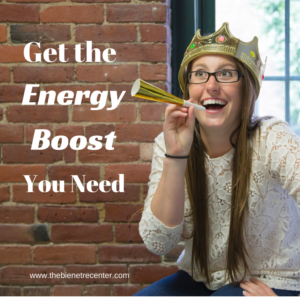 You’ll feel a boost of energy almost immediately. Since these nutrients are delivered via IV and bypasses your digestive system, there isn’t a concern of stomach upset or wondering how well your body will be able to absorb the nutrients. In addition to IV nutrients, we also offer B-12 shots. While injections aren’t for everyone, our B-12 shots do give an immediate boost of energy. If injections are not your preference, we also carry high-grade herbal supplements for those looking for a more permanent, on-going, and lasting energy boost. The Bienetre Center only carries the highest quality supplements from reputable companies who use only pharmaceutical grade ingredients and have strict quality control throughout the entire process of supplement creation. Some products that we recommend often for energy are B-12 Liquid, Anti-Fatigue Complex, and Electrolyte/Energy Formula. If you have any questions about our offered services for energy, please feel free to call us and schedule your consultation with Dr. Burns! Let’s get you energized for your day.